A League spokesman said on Monday that Washington Redskins QB RGIII, who will be going into his sophomore season when the NFL regular season kicks off in just under 15 days, has earned himself a fine of $10,000. The NFL has not officially fined the RGIII as of yet, but the Washington Post reports he will be punished for an "apparel violation" as players are prohibited from wearing unauthorized apparel when they are visible to the Stadium and Television on gamedays, including pre-game warmups. The fine was assessed to Griffin for wearing unauthorized apparel during pregame warmups prior to Monday night’s preseason game against the Pittsburgh Steelers at FedEx Field, the person said, speaking on the condition of anonymity because the fine had not been made public. The person did not specify which article of clothing caused the violation. Griffin did not play in the game Monday night. The Redskins plan to withhold him from the entire four-game preseason as he works his way back from knee surgery in January. 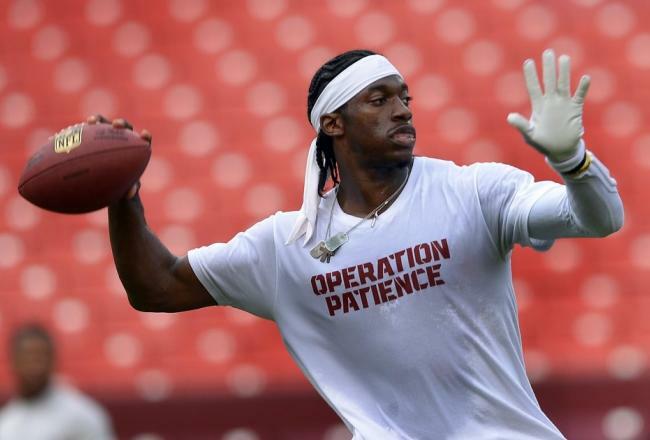 He did drills on the field before the game Monday night wearing a shirt that said, “Operation Patience,” which he said early in training camp he was calling the team’s plan to ease him back toward full-time duties. This isn't the first time however that RGIII has been fined by league officials, infact he was fined by the league last December for committing the same act, RGIII wore Adidas, who he endorses to a post-game press-conference, when the league's official apparel partner's are Nike, this also resulted in a $10,000 fine. 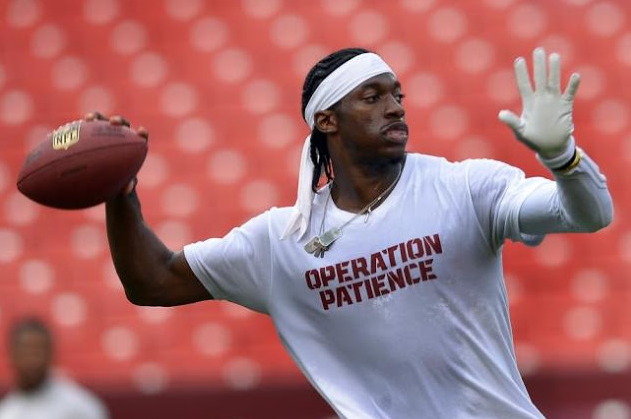 But one thing that is for sure, is that RGIII has been training hard after his injury and hopes to build on his successful first year and "Operation Patience" may be over sooner rather than later.